1) Assure you get the most out of your warranty. 2) Cut down on confusion and frustration. 3) Quicker service and customer support. 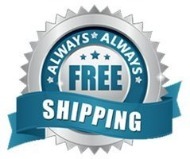 Only website in the world to give free shipping no matter what the purchase is, even if it is for $1.00. Can't beat that anywhere. Deals that is too good to be true. Limited Quantity. Different deals, different days.